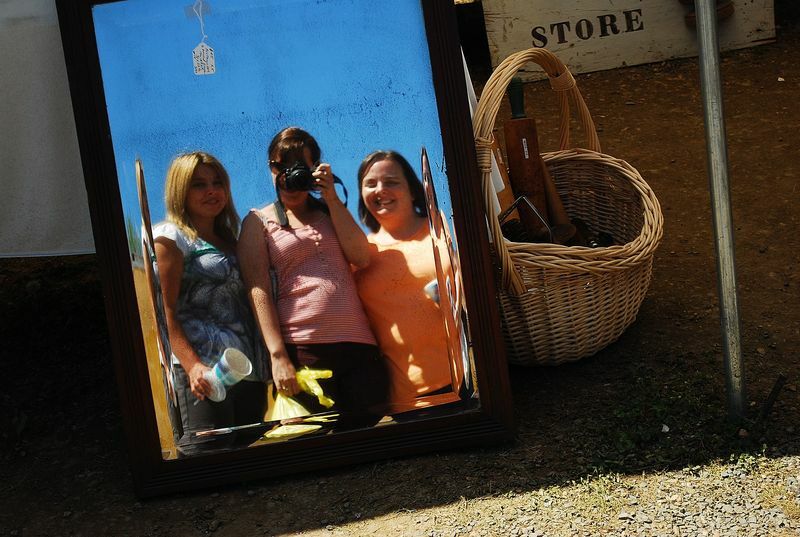 *This is a tale of two sisters going to Brimfield AGAIN. There is always so much for two sisters to see and lots to laugh about. 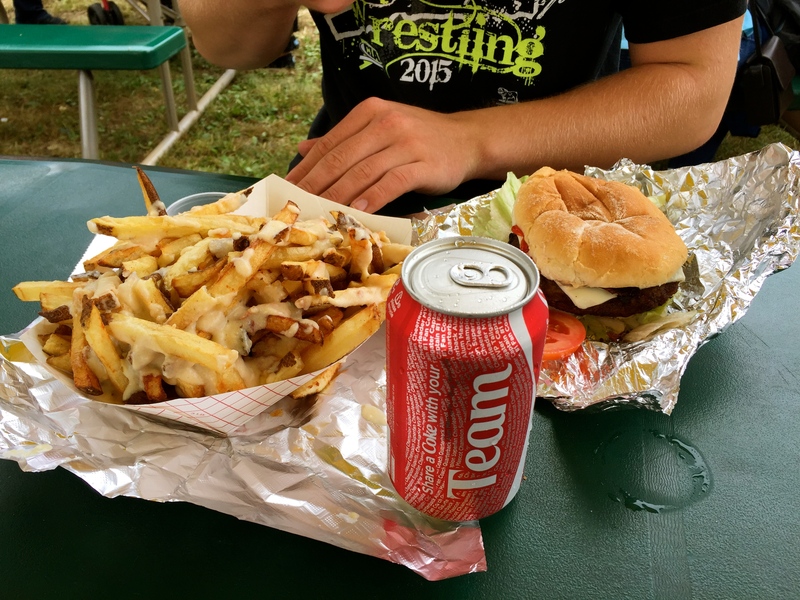 Brimfield day fills us up. We’ve taken our children before in years past, and this time Amanda brought along her niece, who was so cute and a good sport. Look at this collection of Tasha Tudor books we found!!! The prices were, by my estimation, full market value. But I didn’t care, because when the prices are high I simply take a photo and learn something. For instance, maybe I’ll find one or two of these books at Goodwill someday! We thought of Mom whenever we saw glass jars, and of brother Dave whenever we saw a piece of nautical art. Amanda looked so cute in her red sneakers. We thought this huge flat basket filled with dried flowers and grasses was so “primative-pretty”…….it’s fun how different booths have different “feels”. Some are soft and pretty, some are manly with lots of dusty tools and rust, some are full of dishes (my favorite), some are like walking through a garage sale with no rhyme or reason to the display, some are artfully put together, some have cheerful happy sellers, some have grumpy “don’t insult me by asking for a lower price” sellers. There were LOTS of shoppers on Friday because it was the nicest day to go, weather-wise. The heat had finally broken after days of sweltering humidity. Oh my, a feast for my fiesta-loving eyes! I had to get a closer look at the grasshopper who also obviously loves fiestaware. Amanda gravitates toward plaid and wool… (she tried on this shirt). 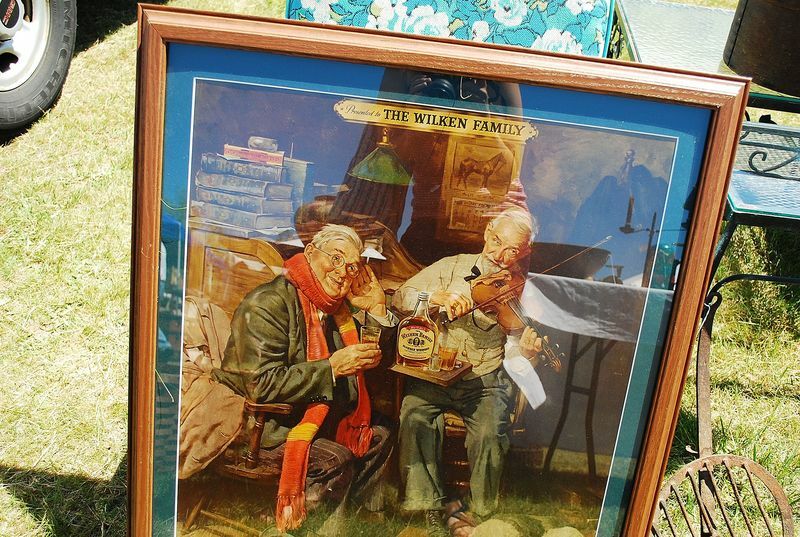 Our biggest “what the” moment was when we were admiring a stack of vintage wrapping paper and when the lady named her (too high) price she explained that it was “inspiration for Ralph Lauren who was expected to appear in the fashion tent that day”. When I told her I just wanted it to wrap presents with it she gave me a better deal!! So that was nice. 🙂 But we were laughing about this situation for a while afterwards. 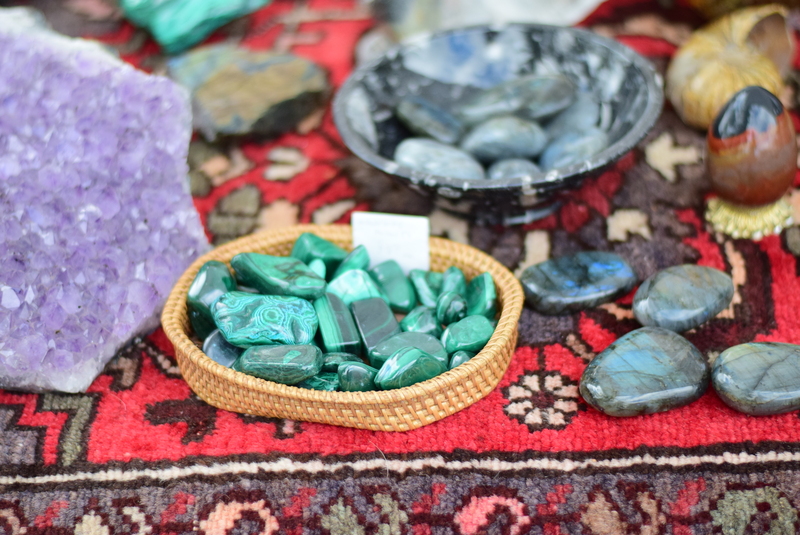 I was so happy to find a display of “stone fruit”, another collectors item that I LOVE but will be looking for…. at Goodwill. 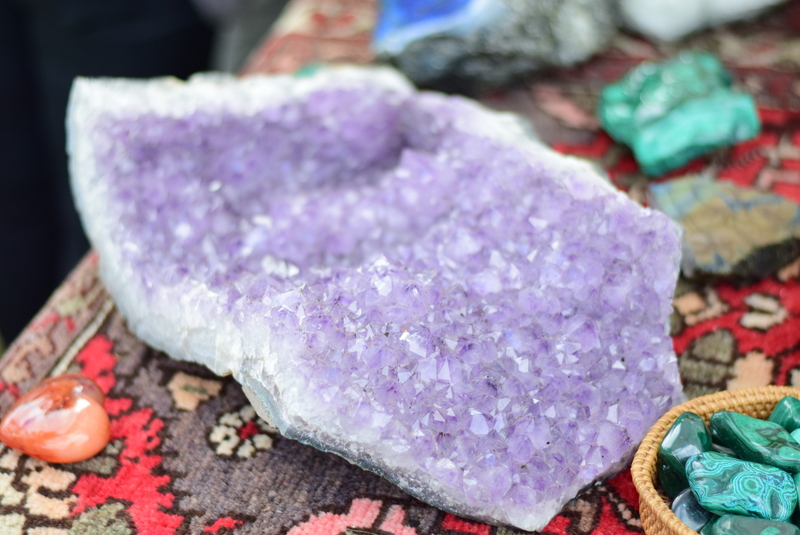 These pieces are all heavier than you would expect and we picked up some of our favorites to hold in our hands. You can zoom in on the price list. 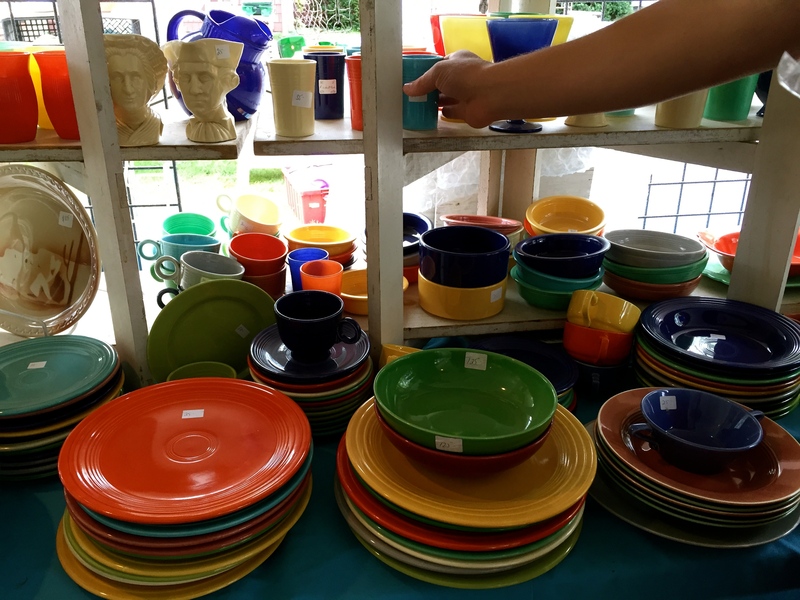 I loved this table of fiesta because he had it priced reasonably (for me–it’s all objective–) and I found a mug for five dollars. HOWEVER, I did buy a shelf of vintage fiesta from a guy for 250.00. The only pieces I didn’t take were the teacups because I hate teacups unless they are a valuable color like lilac, medium green, or sapphire. He asked for 275. but wanted cash so I said “if I have to walk down the road to the ATM I’ll give you 250,” and he said “fine.” He was pleasant to do business with and come to find out he was selling the dishes for an older couple who lived in Maine. The lady was 72 years old and starting to feel like it was time to thin out her collection. He even showed me a picture of her. 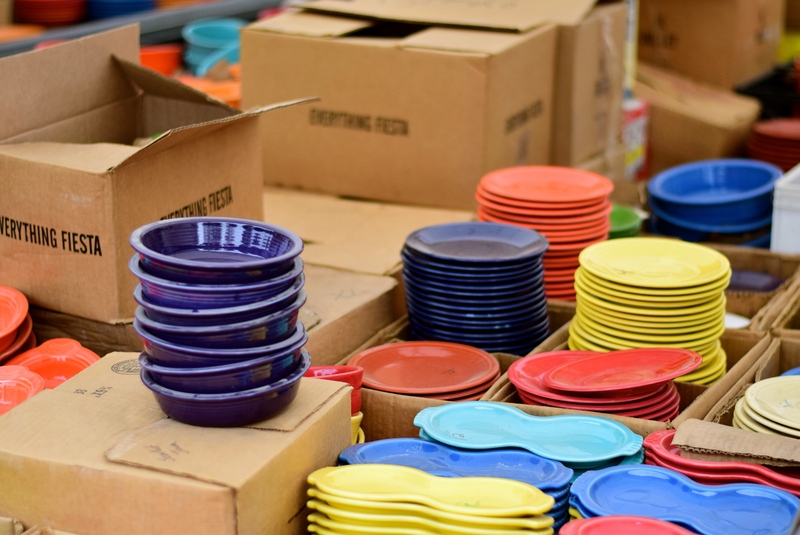 I paid that much because of the lids….it’s harder to find them…the yellow casserole is perfect, the blue casserole is called Kitchen Kraft fiesta and the lid has a teeny tiny crack on the edge, the red lid is perfect but doesn’t go with the red nappy bowl that they put it on, I also got five deep plates (shallow bowls with a larger rim) in perfect condition, a rose sugar bowl with no lid that he threw in at the end, saying “what am I going to do with it, here just take it”, some small plates, and four dinner plates. All perfect. Everything was good except for that blue lid which kind of bothers me but oh well, I didn’t see it until I got home, and I looked up all the prices on everything and still feel that I made out well with my purchase. 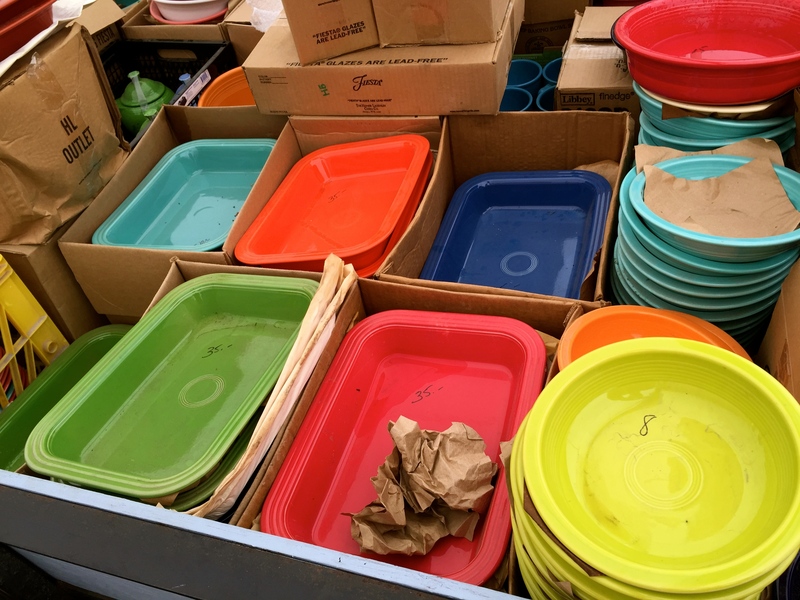 The yellow casserole alone, for instance, was marked 195 in another booth, and a stack of red plates in another booth were 10 dollars each. So the casserole and dinner plates alone could have cost me 250. But in all my researching at home on Friday night, I discovered that an annoying vintage plate that I bought years and years ago, which was oddly FLAT, had no marking, and was what I thought a “beginners shameful purchase”, most likely a factory flawed piece, and perhaps not even really fiestaware was REALLY A RARE CAKE PLATE worth 1,000. But it’s gone. I’m pretty sure I got rid of it, I’m 95% sure I stuck it in a bag for goodwill one day when I was purging the house. I already searched every place it could have been in my house to no avail. This is why people should shop at Goodwill. Collecting has it’s fair share of thrills and agonies. The 24 pieces on the bottom right of my hutch are the new ones. To my kids and future Grandkids: someday this will all be yours. We haven’t had our lawn mowed yet so there are wild violets growing everywhere. They are abundant and I found myself wandering around picking a tiny bouquet of them. The white ones are the most fragrant; beautiful, creamy white with deep purple lines from the middle pedal and just a hint of yellow there, too. We are blessed in violets. Another kind that I noticed was white with a deep blue center, with blue veins coming out from the blue. Also noticed was a thin grapevine twisted around and up a tree, just the right spot for another photo opportunity for my violets. My very favorite one is light lilac in color, with thin delicate pedals and a flat face…in the photo it is the one closest to my hand, picked last. I only know of one small patch of these. The most common purple ones are growing everywhere. Tied with a ribbon, they dress up the kitchen windowsill very nicely. 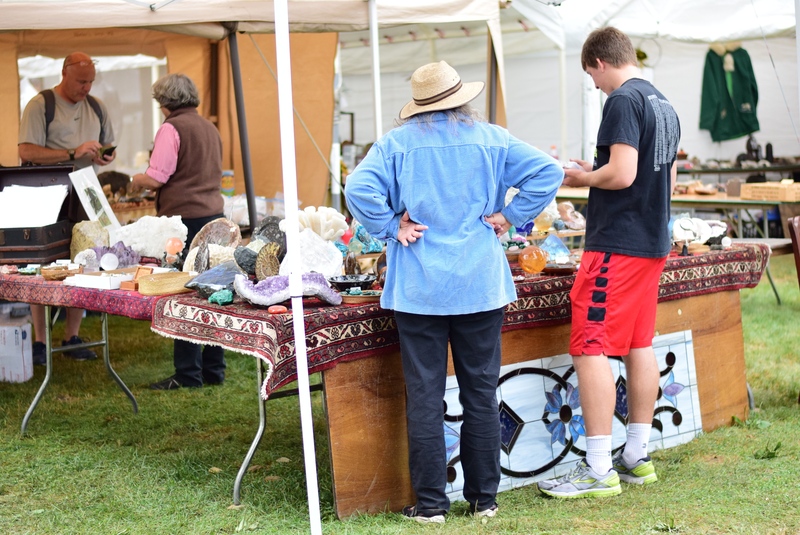 Yesterday was opening day of the Brimfield Antique Show so when the children left for school, I drove to the show. I arrived early enough to get parking easily. Later on when I left it was crowded and some of the parking lots were full. It cost 10 dollars to park at the church, and I always park there each time I go. When I got out of my vehicle I heard one of the attendants call over to another older parking attendant to ask “Which one of these trees did you plant?” He laughed and looked back and forth to a couple trees; “That one.” It was stately tall and mature and I marveled that it had grown so much in the man’s lifetime. Already I was collecting beauty and inspiration from people…….I wanted to go home and plant a tree. I thought of Jo and Dawn when I saw these darling little tap shoes. Within 10 minutes I had made a fiesta purchase; a tea cup and saucer in the hard-to-find-and-afford lilac color. (to match the violets) at a great price! 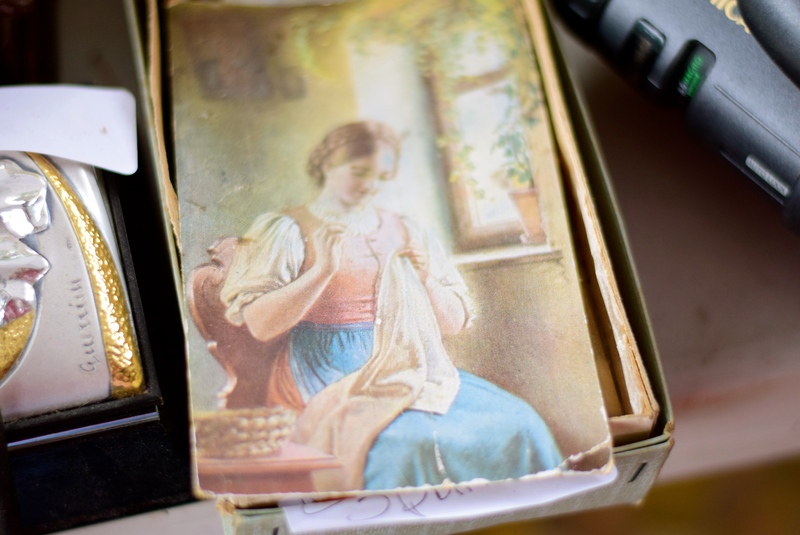 And I thought of friend Hannah, and my dear mother, whenever I saw sewing things and fabrics. 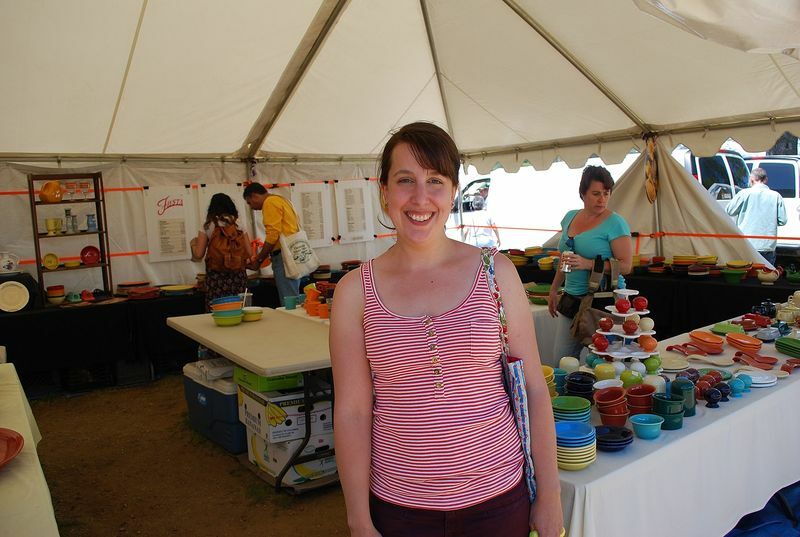 I bought a vintage yellow dessert plate with stripes. Someone mentioned on the fiestaware FB page that they thought it was part of a Sears cake set sold years ago. I found a shiny and perfect medium green plate (most rare of all the colors) and was able to purchase it for 30 dollars. 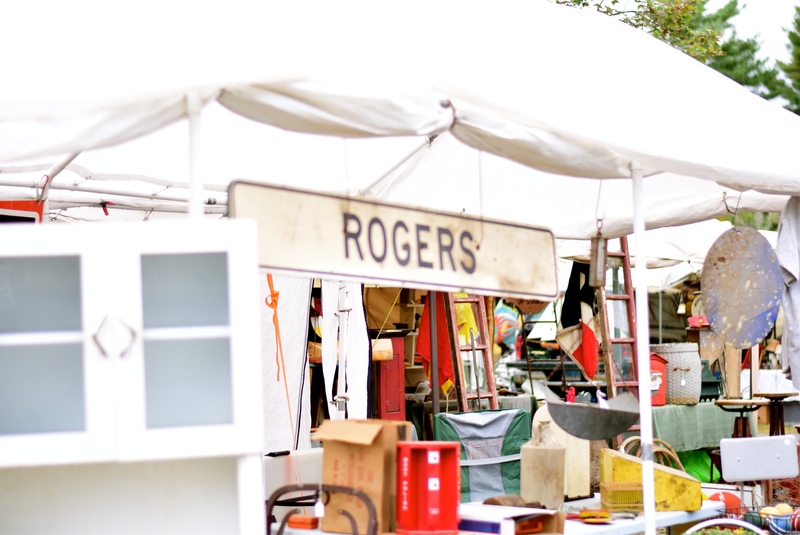 I normally go to Brimfield with someone else (or two or three) and I wondered how I would enjoy going alone, but I simply loved it. I would rather go with one or two of the children, or my sisters, or aunts, or friends of course but going by myself this time ended up being a much needed treat. 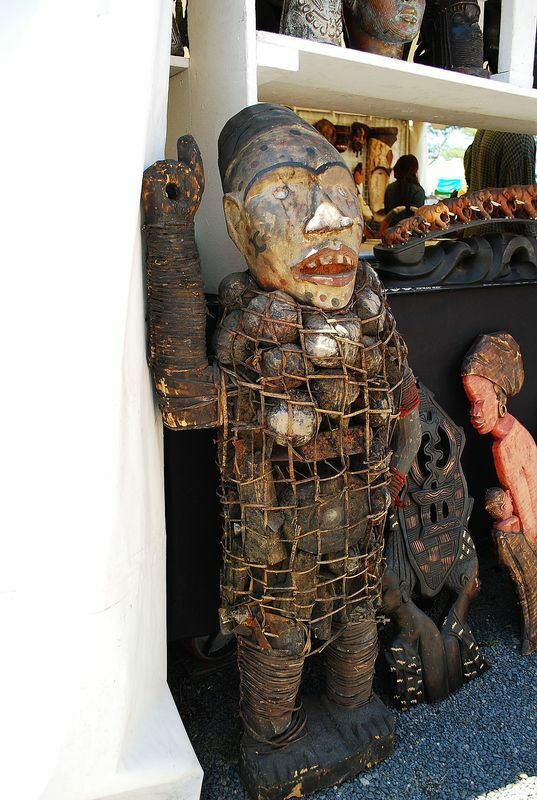 I loved thinking only of myself and quietly going around watching people and looking at all the things people were displaying and selling. I took my lunch and ate it as I walked; a pb and honey sandwich, a cliff bar, an apple. All in all, I spent almost 4 hours and walked about 4 miles before I left. 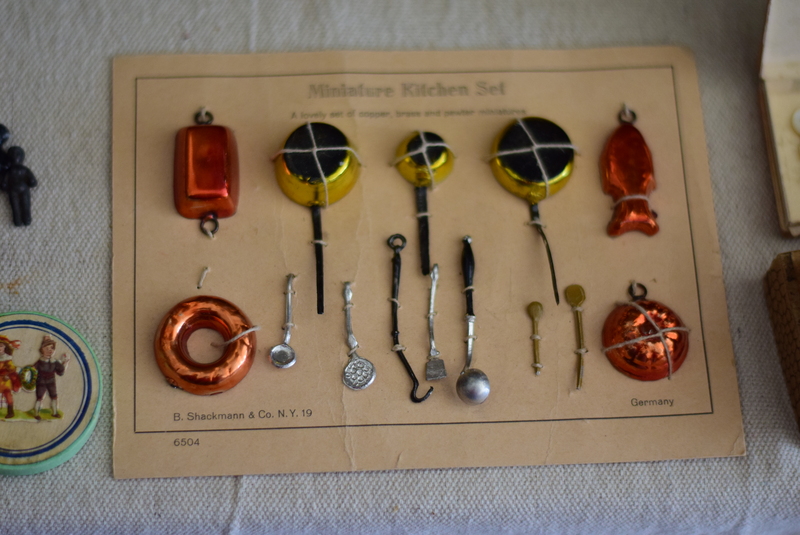 It felt wrong in a way to leave Brimfield and go straight to an antique store (because Brimfield is nothing but antiques as far as the eye can see) but I had remembered a few things that I had wanted to buy a few months ago, so I headed to one more shop before going home for the day. The things I was looking for were gone, but I still enjoyed browsing. 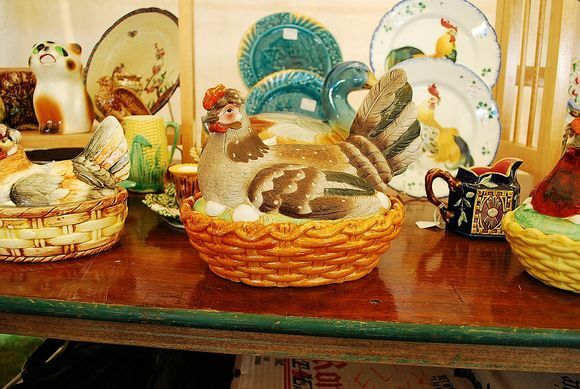 Antiquing is like a little history lesson of ordinary life. Jus took at that big red fiesta platter (not purchased, but admired) The colors are so energizing and cheerful. Well, then I drove back home and determined to stay in my kitchen until it was spotless so I turned on some music and mindfully washed up the dishes, cleared off the counters and scrubbed them, and swept the floor. It’s more fun when you can concentrate on what you’re doing rather than rush through to get to the “next thing”. 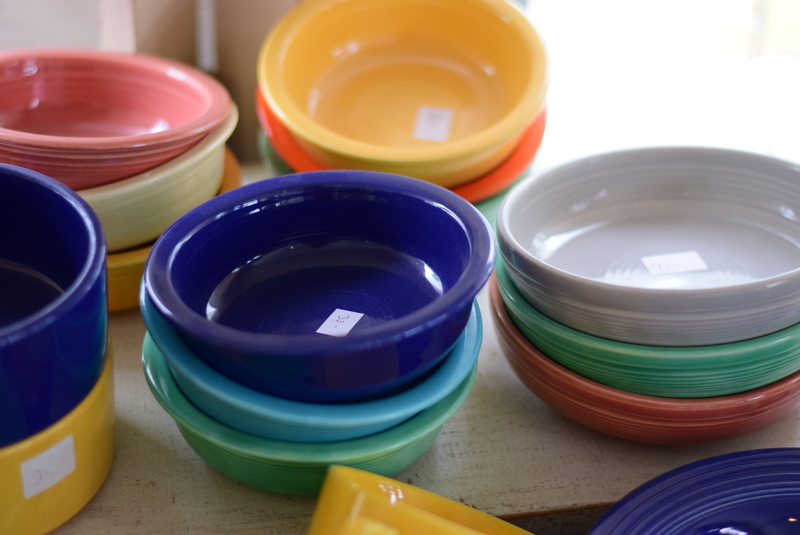 Pictured above are the fiestaware pieces that I bought yesterday. But I have already thought about NOT buying anymore of it for a while. I am content with my collection. I have a piece of every color and then some. 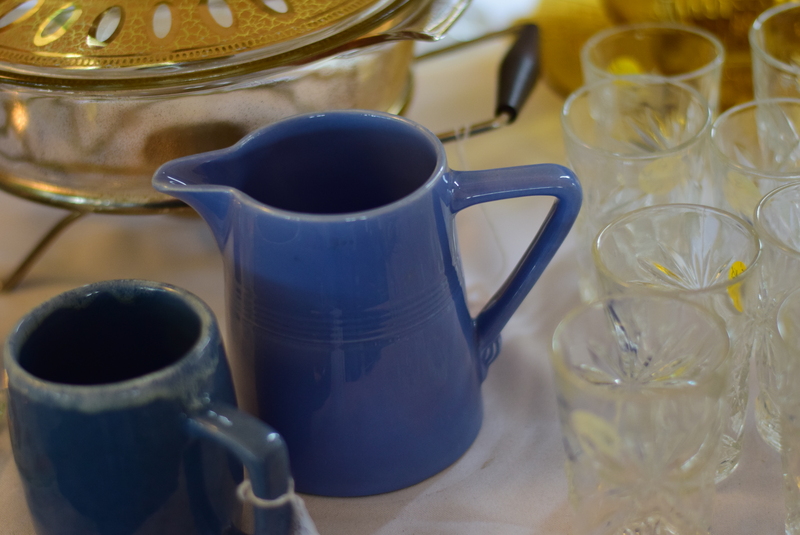 I have vases and teapots, pitchers, canisters, vintage, and new. Salt and pepper shakers, spoon rests, trivets, pie plates. Plates galore. Common pieces and rare. Some to display and others to use everyday. It’s a satisfying collection. A Tasha Tudor craft-type book, paperback, which I had never seen before. I can’t wait to look at it slowly and try some of the projects. A lady in Brimfield had a “just my style” booth that she told me she started doing when she retired. 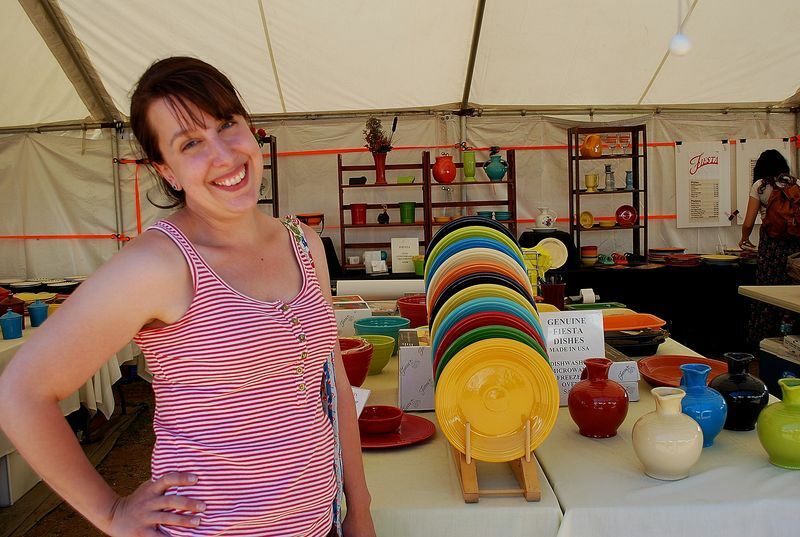 She does all three Brimfield shows a year and also does her own show. She had pieces of furniture, and housewares, vintage laces, baby things, new and old. At the counter she had a display of scrapbooking packets that she put together and I couldn’t resist buying one. More old papers for scrapbooking and journals. This was such fun. 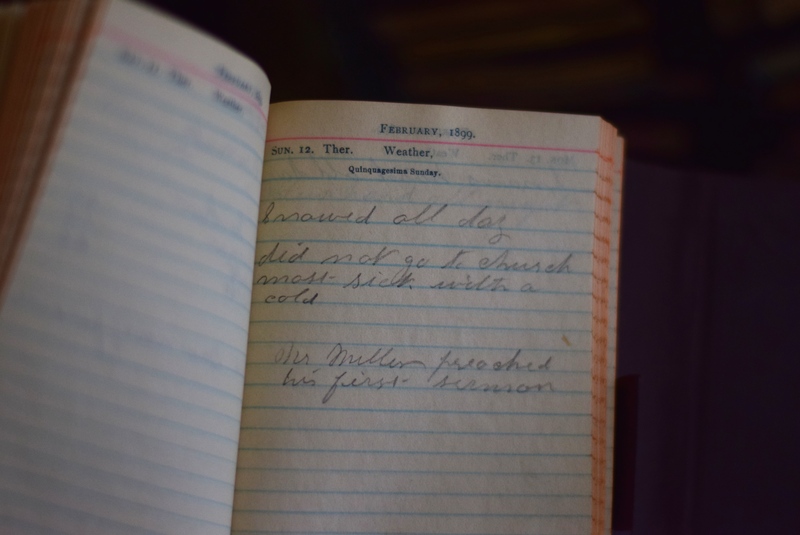 “My School-Day Autobiography” owned by Doris Jeanette Reid. Perhaps you know her. I would love to send it back to her, or her descendants. 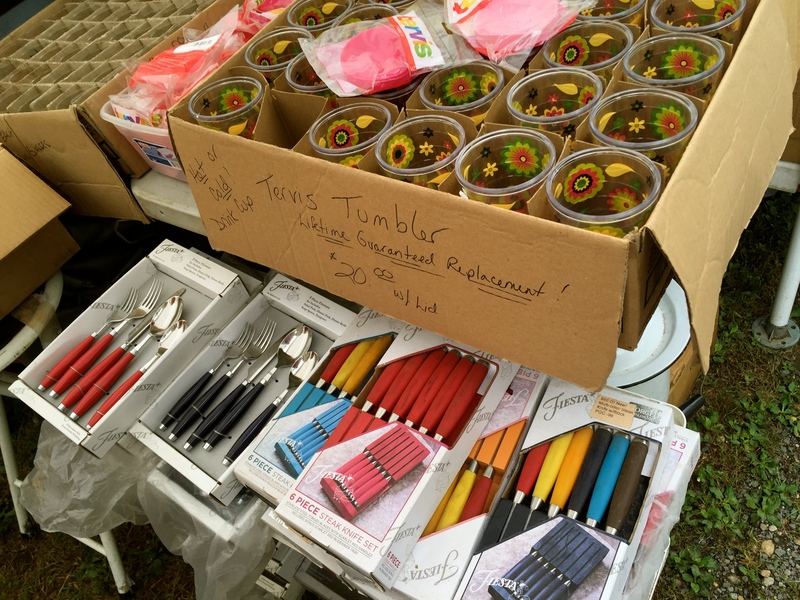 How do things end up being sold and bought by strangers? Taped on the last page. 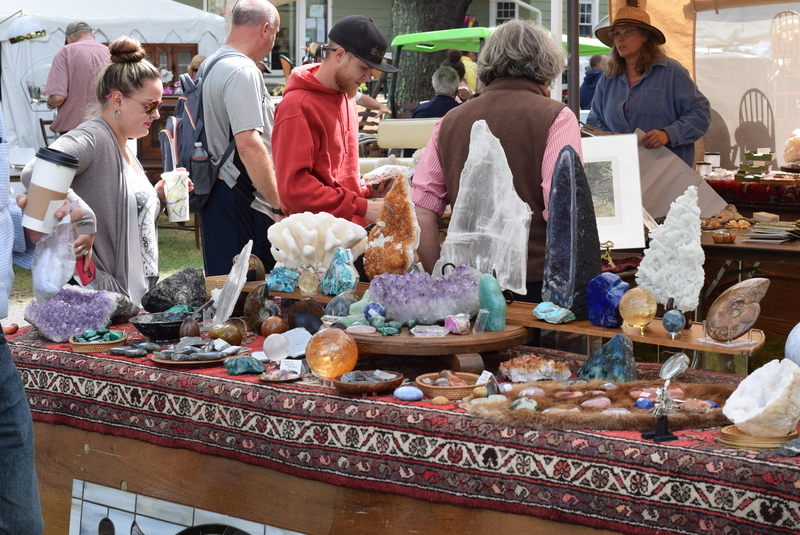 We live about 40 minutes from the Brimfield antique show so I will have at least one post a year (I think this is the second one this year) regarding the show…..it is just so fun to drive up in the morning, walk all over the place, eat lunch, and then come home. Especially if you’re with a sister or two. Amanda found a nice green table with glass inserts right away for only 40 dollars so we walked it back to the car. Apparently I can show restraint now and then. We thought this was neat…someone “carved” these tins into Halloween jack o’ lanterns. They will look neat with a light inside. Amanda bought a wool blanket. I found three wooden bats for Seth. And, I bought this little xylophone. It makes a very pleasant musical sound. 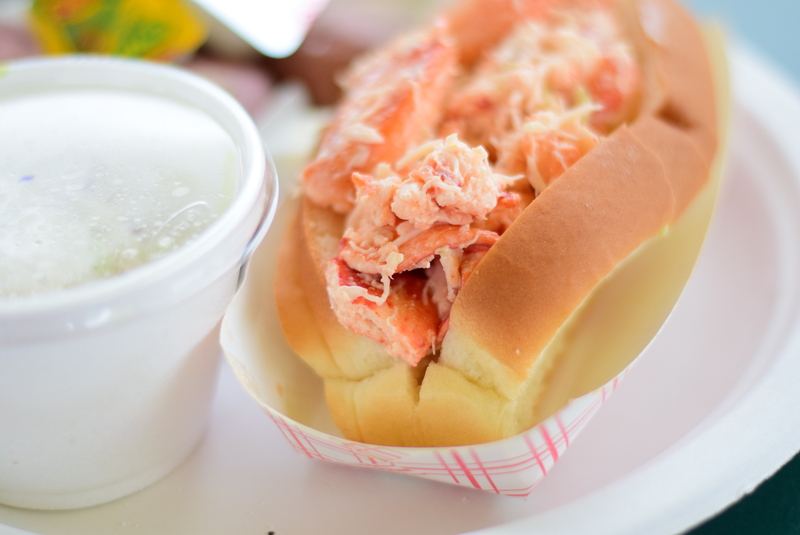 We had lunch right there at the show (hot buttery lobster roll for me!) and then headed home, stopping at the thrift store in town and the diner for ice cream cones on the way. 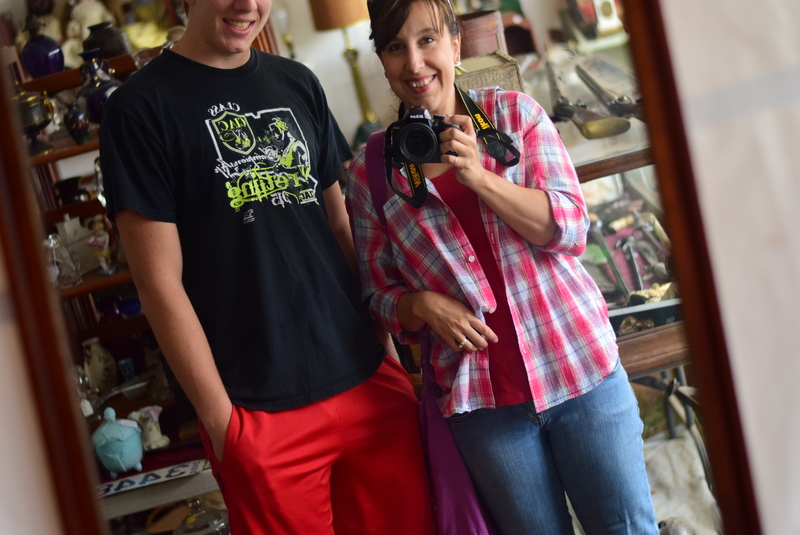 Jacob and I went to Brimfield yesterday. 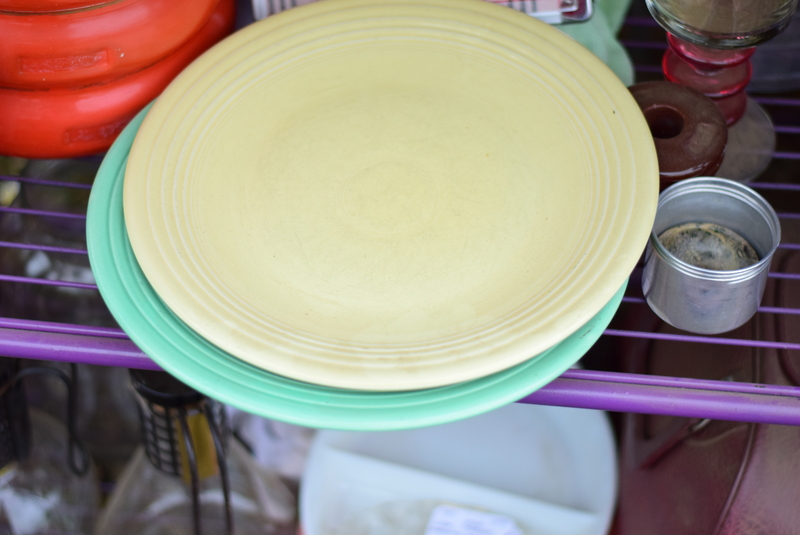 Not only are my dishes useful but they are also decorative. 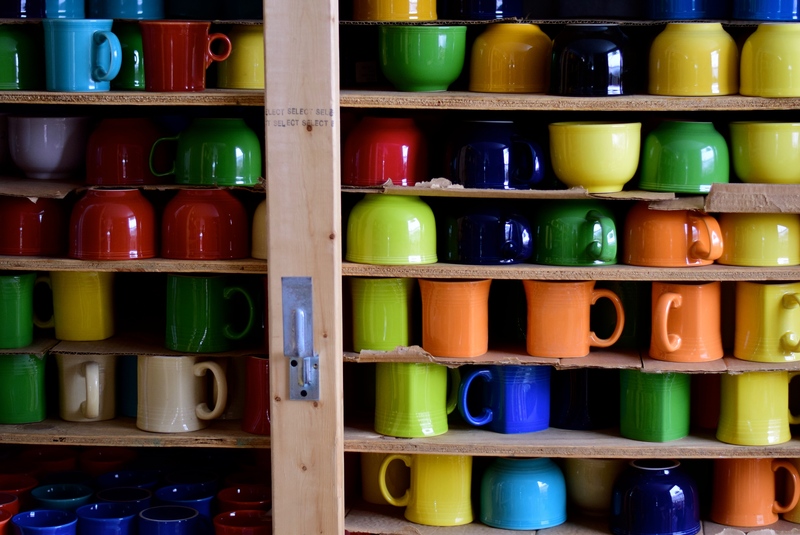 They add all the color to the otherwise neutral kitchen. Things not to be used are on the top shelves. Everything else is used daily. In the morning I used my claret mug. He made the coffee while I made waffles, scrambled eggs, and sausage for our children. Saturday mornings. The girls and I were downtown. We had a picnic across the street from the coffee shop in town. The flowers are so lovely there. I met a Kindred Spirit in the thrift store book room. There were two stacks of Scrapbooks made by her, full of everything I also like: heartfelt articles, poetry, comic strips, news, cards, pictures. I chose some to bring home (8). I will show you some of the things in them on another day. They are amazing. The lady’s name was Jean and she made the scrapbooks in the early 1960s. She was a teacher. Someone loved her named Bill. 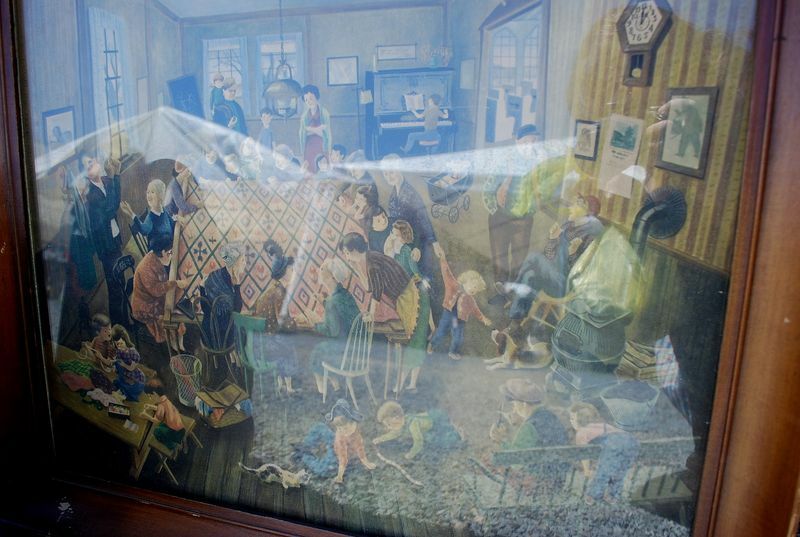 I’m currently typing these words on my bed surrounded by the things she found interesting enough to cut and glue into books……..
It’s sad that they ended up in a thrift store, wasn’t there any family who could have kept them? I left over half of them there on the shelf…..but at least there are some home with me and I will have the coziest time looking through them. I love them. Gracie in the book room. I’m very disappointed that Sarah, after feeling better for two days, is back to being sick. She is not a person who is calm during sickness, either. That’s why I have the extra time to do this blog post on a Saturday morning. She is sick in bed next to me and if I leave she gets all upset. She needs me. She is currently sound asleep after being awake most of the night. When she stirs, she immediately whimpers and fusses, because her stomach hurts. I pat her and get her what she needs. (a very tiny sip of water, tea she refused to drink, and syrup from a jar of peaches, of which she had a small amount). Mostly she just wants Mama. Rich is gone with Caleb (10) and Seth (6), who needed to be weighed for football and get their pictures taken. Tomorrow morning is their first game (of four). 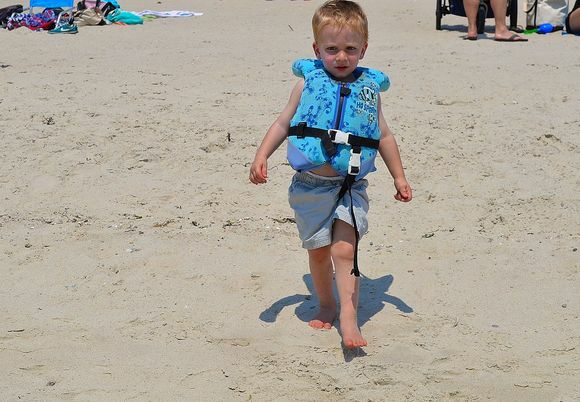 He is stopping to get Pepto Bismal for Sarah when they are done. I hope and pray it helps. The kitten is still unnamed. He doesn’t like to be left alone, the older cats won’t have anything to do with him, the dog is harmless but scary, and consequently he adores his humans. As soon as we touch him, he purrs loud like a little motor. He is curled up in the wrinkles of my down comforter right next to Sarah’s leg. Jacob is looking for a job but for now he has Fridays free (no college classes). 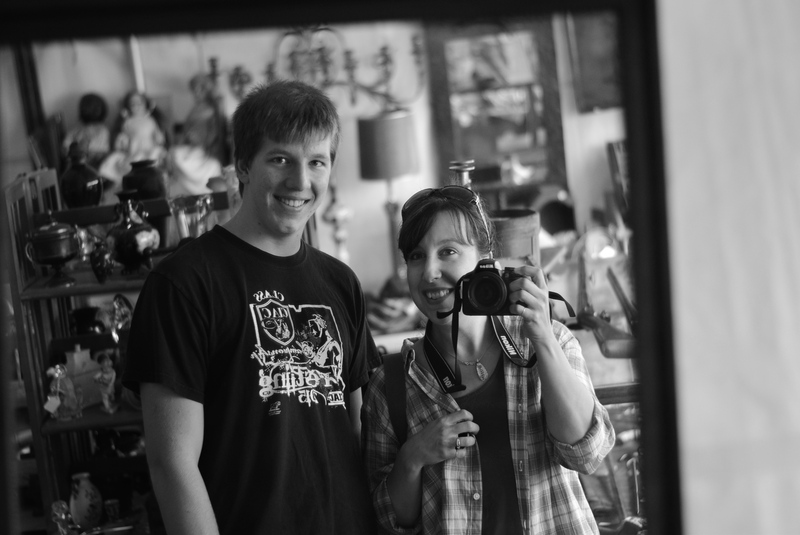 So he and I went to the Brimfield Antique show yesterday. We left the house at about 9 in the morning and came back home around 1:30. 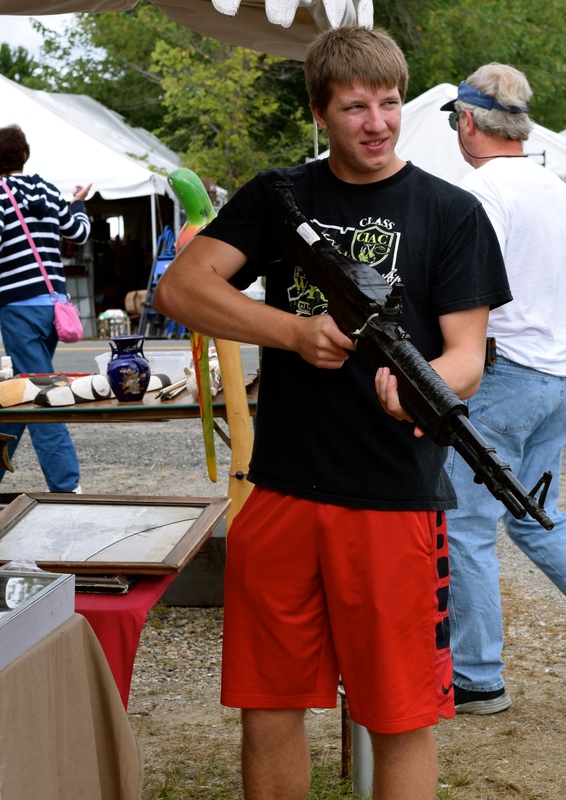 Jacob loves Army related items from all eras, but especially the American Revolution time period, guns and other weapons, stones, and tools. 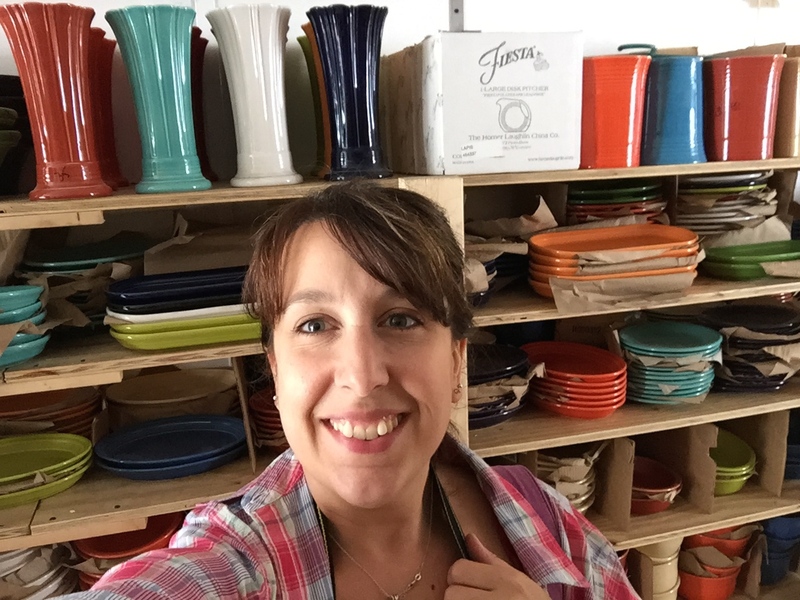 I like all the suzy-homemaker type of stuff…..and fiestware dishes. Right away I bought these two chop plates. Chop plates are a little bit bigger than a dinner plate. The bottom one is vintage light green and the top is Post-86 retired yellow. 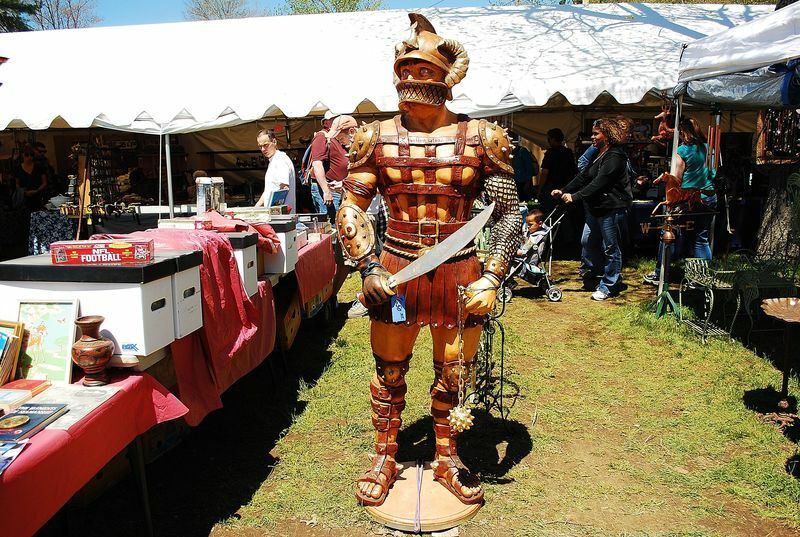 The prices at Brimfield are somewhat on the high end and I usually take photos of things more than buy them. This is a harlequin milk pitcher that the seller was asking 45 dollars for. Harlequin is not Fiesta, but was made by the same company. A lot of collectors of fiesta end up collecting Harlequin as well but so far I have not branched out. The weather was gorgeous. It started out cool and misty but then slowly cleared (but stayed cool). By the time we left the sun was beginning to blaze again. I wore a shirt over a sleeveless shirt so I could take it off and tie it around my waist if necessary. I also enjoy taking photos of things that I know my friends and family would like. (my son Caleb loves the Patriots). My friend B and I both love vintage Strawberry Shortcake. My boys all love Batman. 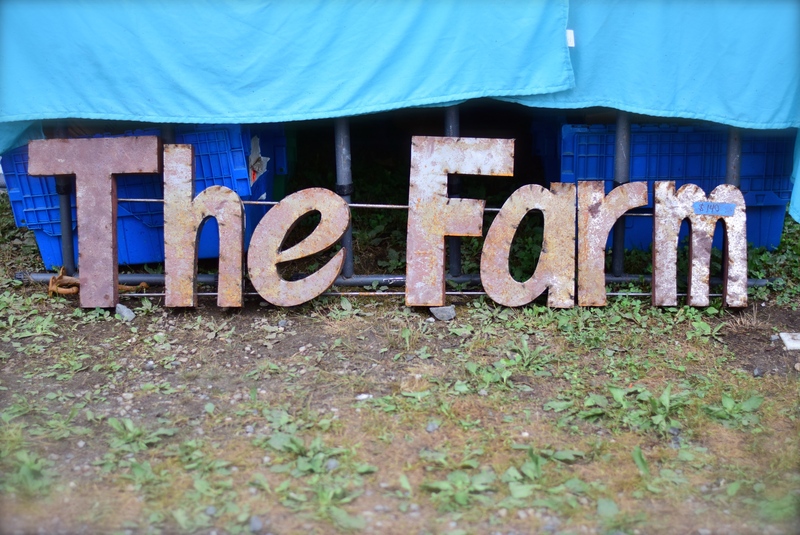 For all of us who miss the Farm. My mom in in the process of furnishing a dollhouse. I probably should have bought these. They were so heavy, I have to believe they were just as fine of quality as real, full sized kitchen things. Imagine baking tiny cakes. The lady was asking 45 dollars for them. I asked the mommy if I could take a picture of her dogs. Are they adorable or what? I looked through this very old diary and was immediately pulled back into the past. I adore this sort of thing…the penmanship, the history, and just by chance I opened it right up on my birthday…77 years before my actual birth. Jacob with a gun made out of rubber. 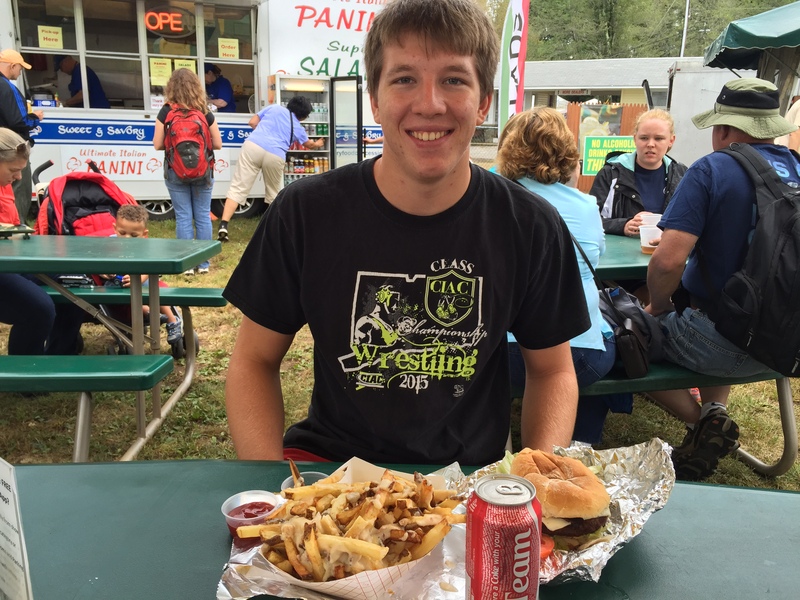 Jacob’s fries were handmade and covered with made-from-scratch bacon alfredo cheese sauce. I had a lobster sandwich, fruited cole slaw, and boiled red potatoes. 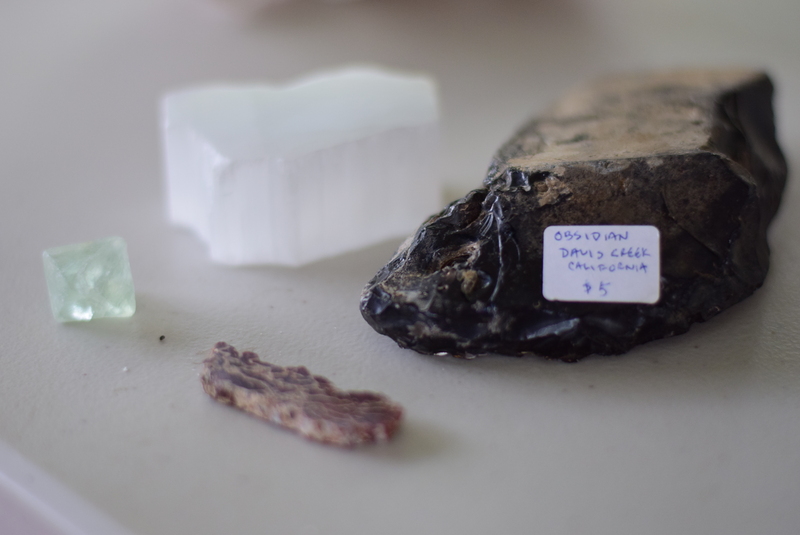 Jacob spent most of his money on stones, which is loves to study and collect. He has a shelf in his room for them. It takes a very long time to decide, I was amused watching him. And the lady told him lots of cool information. He also looked things up on his phone to learn even more. Part of what makes life so interesting is when you take a topic and study it for yourself, because you want to and not because you have to. These are some of the things he purchased. But now….I have saved the best for last! 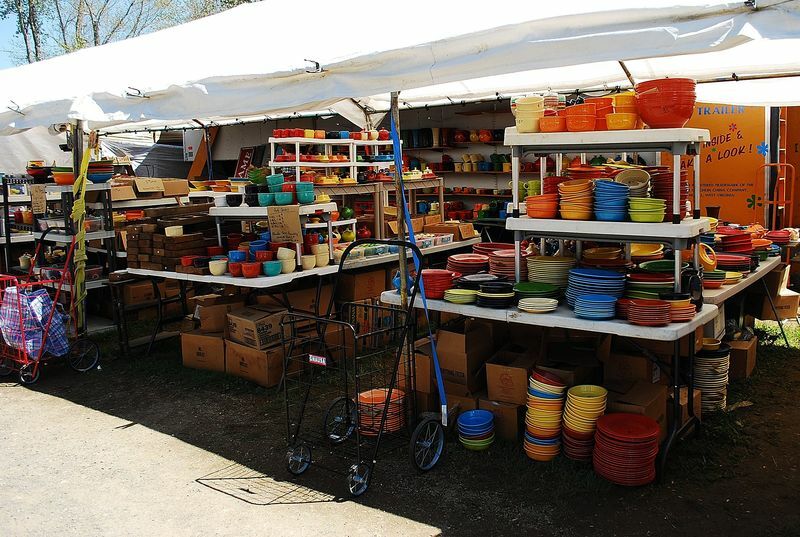 I probably would not be as excited about Brimfield if the fiestaware lady wasn’t there with her 1,000s of pieces. A lot of her things are “seconds” (second rate fiesta, with tiny imperfections) but if you take your time and look at things carefully you can find some good pieces. Regardless, it’s fun to see so much of it in one place and to see some items you may not see in the local stores. I tried taking a selfie with my son but as you can see he was bored out of his mind. 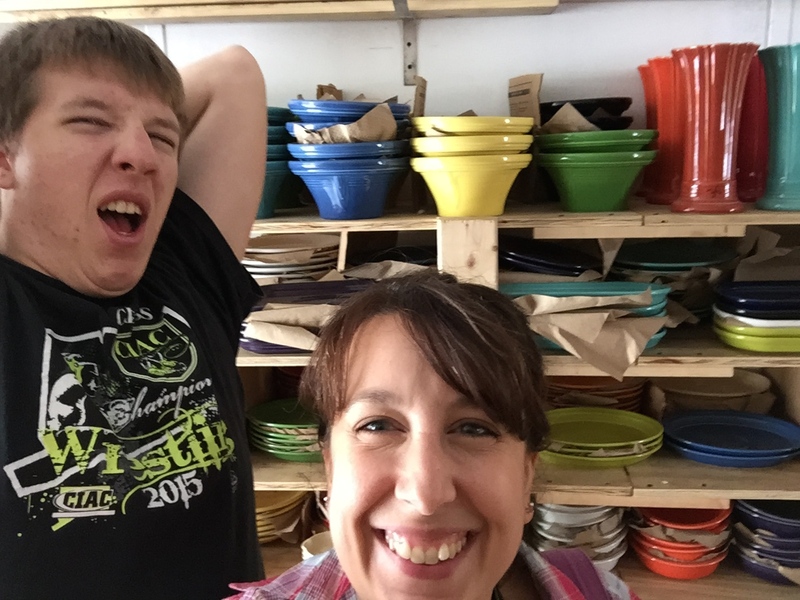 He will not be getting any fiestaware when I die. He told me he was tired of it! I made a couple selections which I will show you at the end of the post. 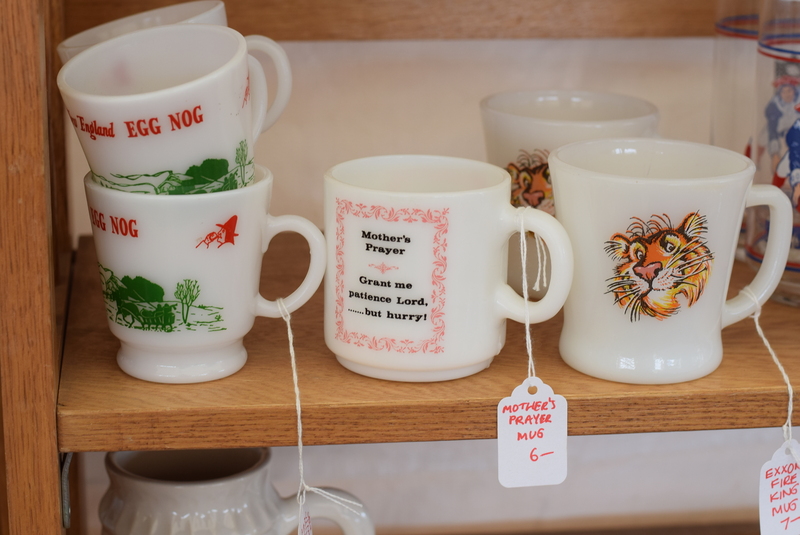 But first, here are some vintage pieces from another booth. 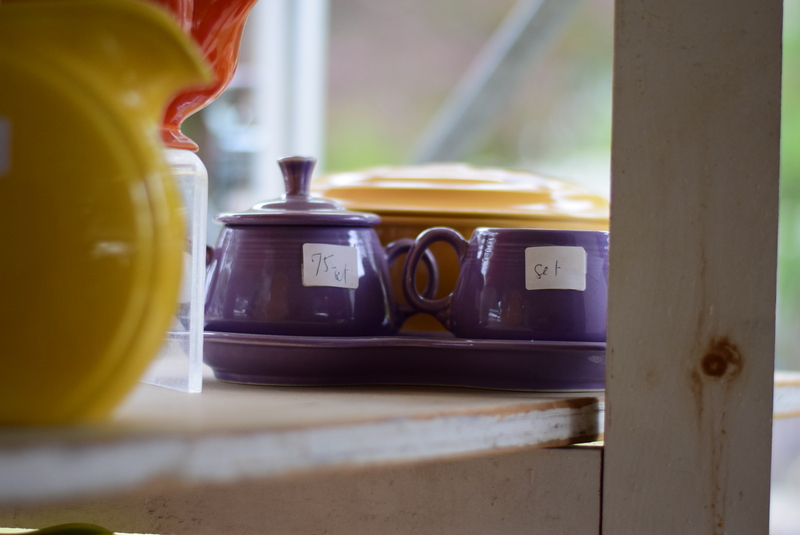 The same vintage seller also had a set of lilac (limited run). I bought nothing from the vintage seller. But it sure was excited to see it all. These were my purchases. I brought them home and washed it all. I put them on my dining room table, which was spread with a Fiesta tablecloth. 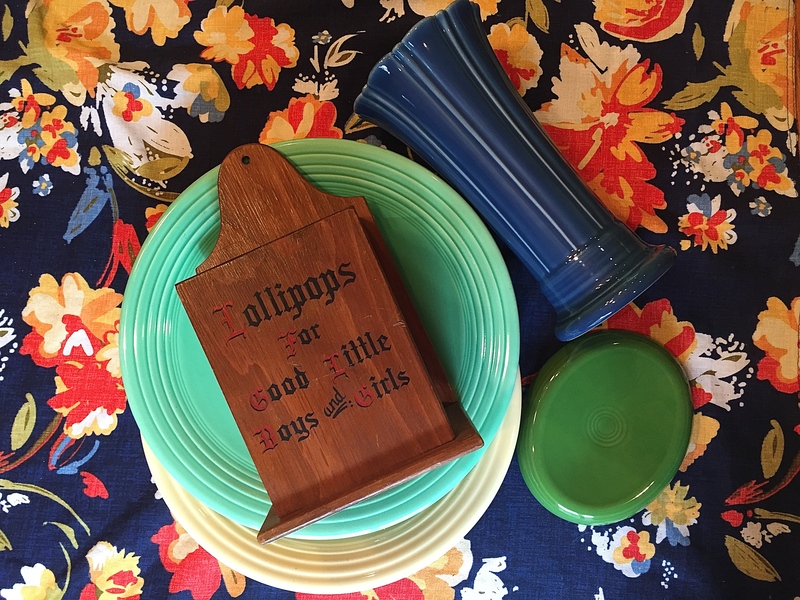 2 chop plates, a new Lapis vase which will look beautiful with wild flowers in it, a shamrock soap dish, and a lollipop box which I love and already put lollipops in. Last weekend, my Uncle Roger and Aunt Colleen came with their four girls. Colleen is less than 2 years older than me, I’ve written about her before, as we like to have adventures together now and then. We grew up as neighbors, having lots of fun, making memories, going to the same school and church, and getting into our fair share of arguments and drama. I used to hang around with Roger and Colleen when they were dating and I was in their wedding (I sang!). 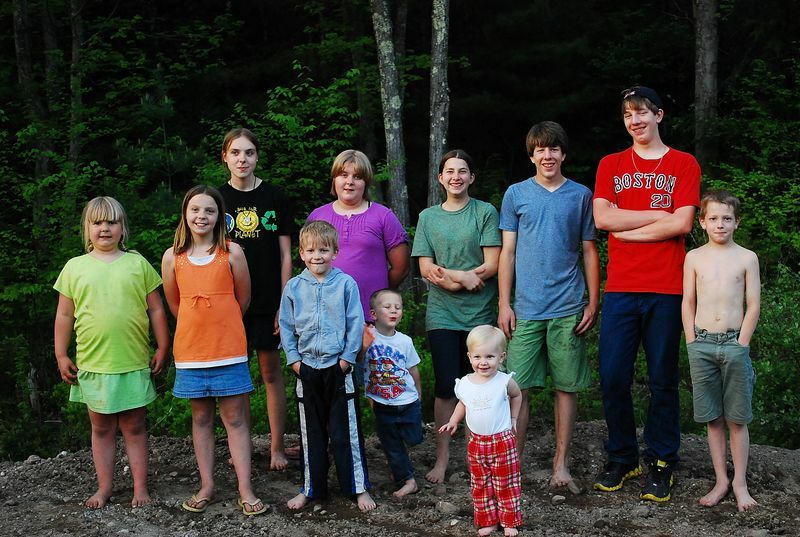 Colleen and I had our children during the same time frame but usually in different years, so we have a real variety in ages when we get together. 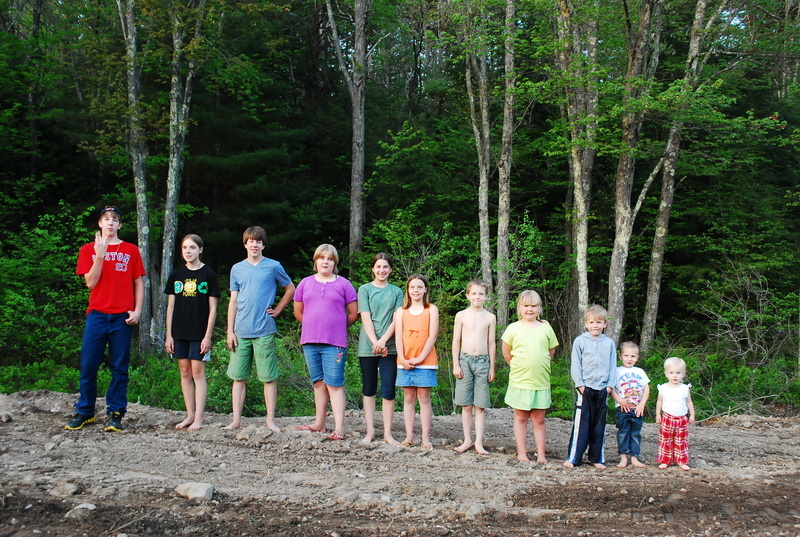 The kids all get along so well and we love to sit and watch them play. It’s been a long time since Colleen and I argued, but we still know how to laugh and talk just like always. 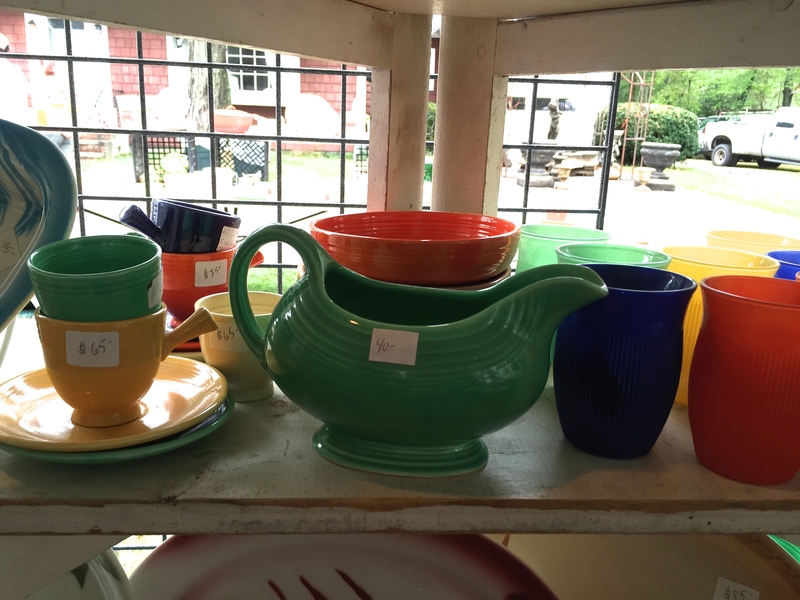 While she was visiting, Colleen and I went the Brimfield Antiques show, which is held three times a year, less than half an hour from where I live. 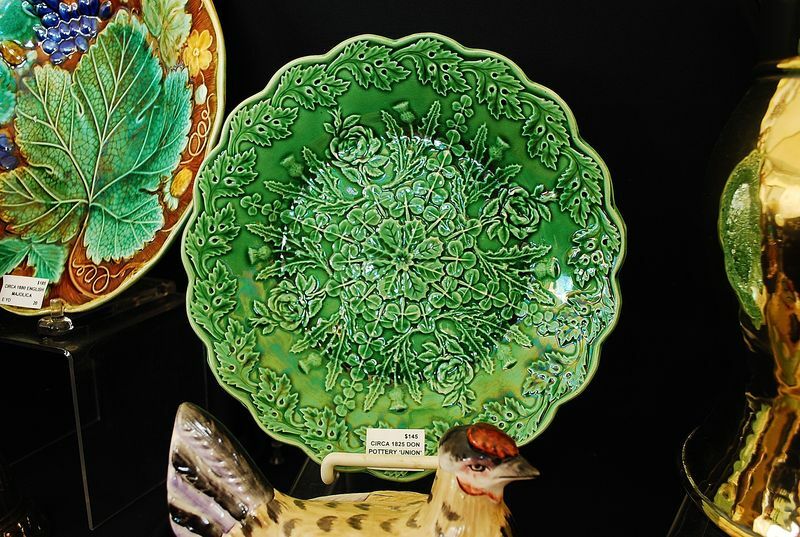 This is a huge antiques show for our area and has been featured in Country Living magazine. 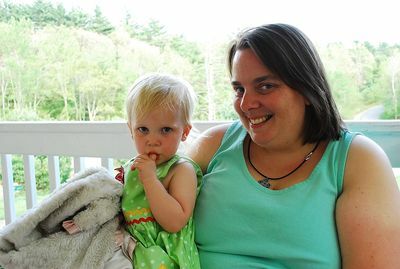 My sister Amanda had gone during the week and she met us there on Saturday, too. I took pictures of things that caught my eye and reminded me of people. 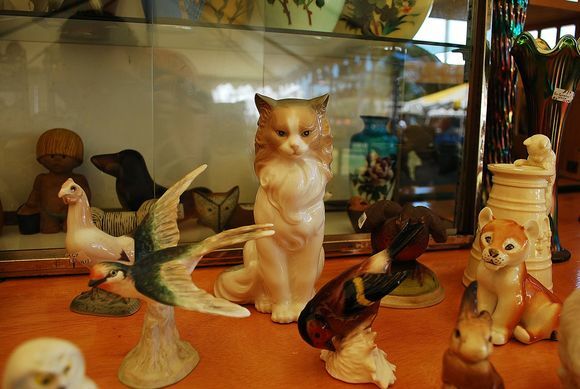 Grace loves cats and nick knacks. These plates reminded Colleen and me of Aunt Mary and my mom. We knew Jacob and Ethan would get a kick out of this man. The glare on this *picture of a picture* is terrible, but I wanted to share it for my quilting friends (Polly, Hannah); I thought this was such a happy piece. It’s a quilting party, with ladies working on the quilt and all the big family filling up the room. I do wish I had purchased this, why oh why didn’t I? We stopped to chuckle over this and named him “Boulder Boy” right away. There are a great many odd things to see at this show. 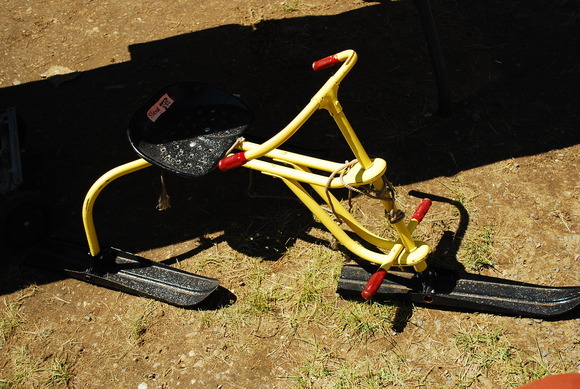 This made me think of the little boys…and how much fun they would have trying out this sled……I had never seen anything like it. Take a look at this fiesta tent! OOo la la! These are not antiques, just a lot of seconds (=affordable!) from the factory store, but still oh so exciting for me. It was a hot clear day and I did get a sunburn. When I went home I rubbed aloe plant all over it. I took home a peacock blue jam jar. I didn’t know these were made yet, so it was a happy surprise. 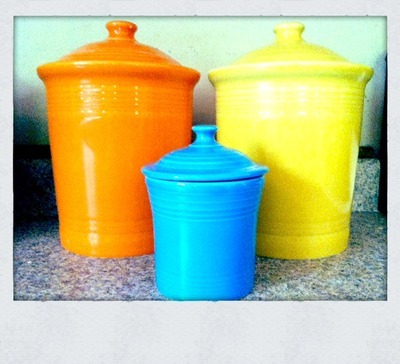 I already owned the large canisters, the jam jar is a miniture version. 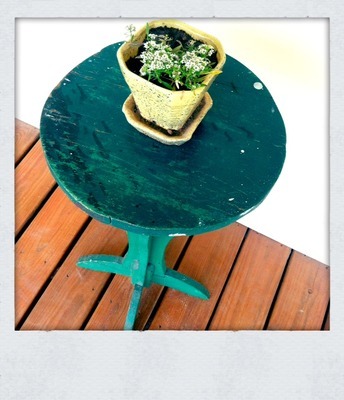 And I also bought this dandy (about 4 feet high) green plant stand.